dinghy in hopes my shopping spree is short. 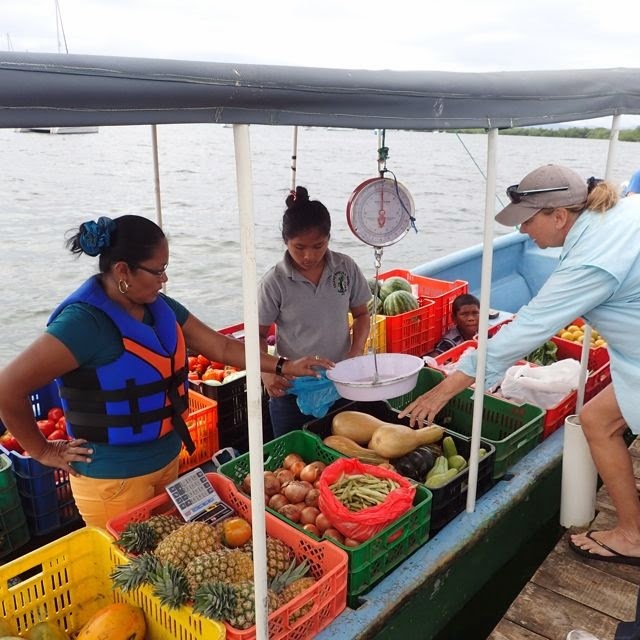 "And the Veggie Boat comes into the marina on Saturday mornings," Alice Kilgo of Ocean Star added to the end of her very long and incredibly helpful list of info when we arrived in Bocas del Toro's marina, our first Panama stop. 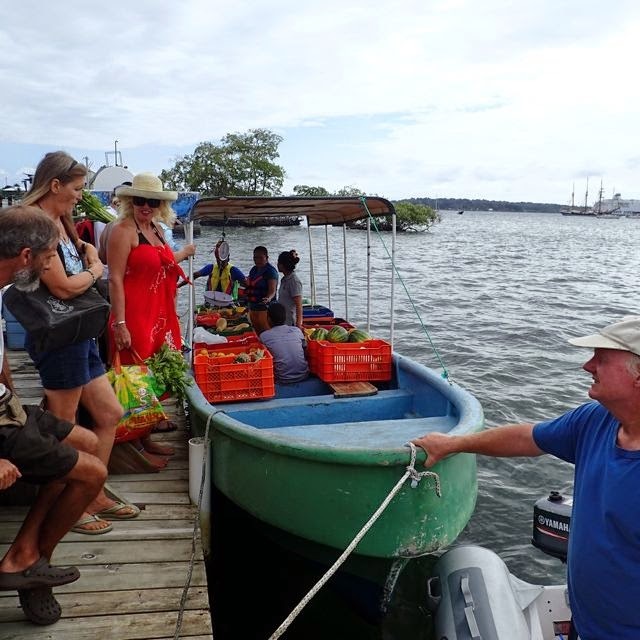 Fresh produce is a precious and often elusive part of our gluten-free diet, though truth be told, we were far too out of it our first Saturday in Bocas. We missed "the [produce] boat." 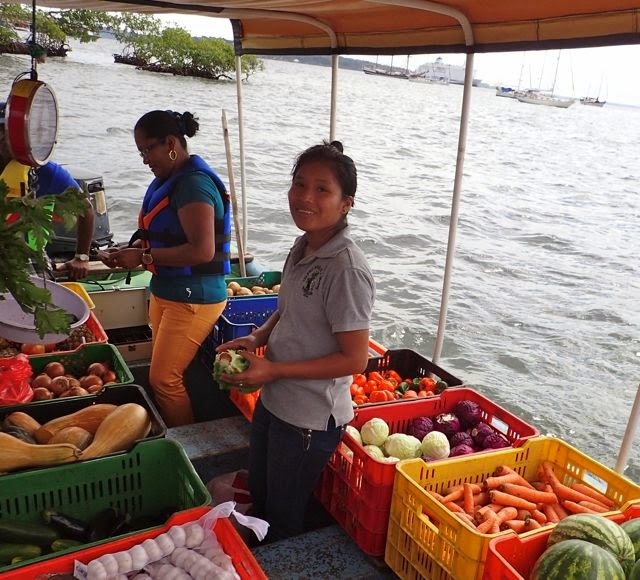 Service with a smile from the veggie boat. As luck would have it, we got another go of it the following Saturday. We we about to leave, but were waiting for a rare opportunity to "pay-it-forward" -- give another cruiser some key e-files -- charts and cruising guides. He hadn't yet come by, and someone announced on VHF channel 68, "The veggie boat is in." We were anchored only a few hundred yards outside the marina where the boat docked. 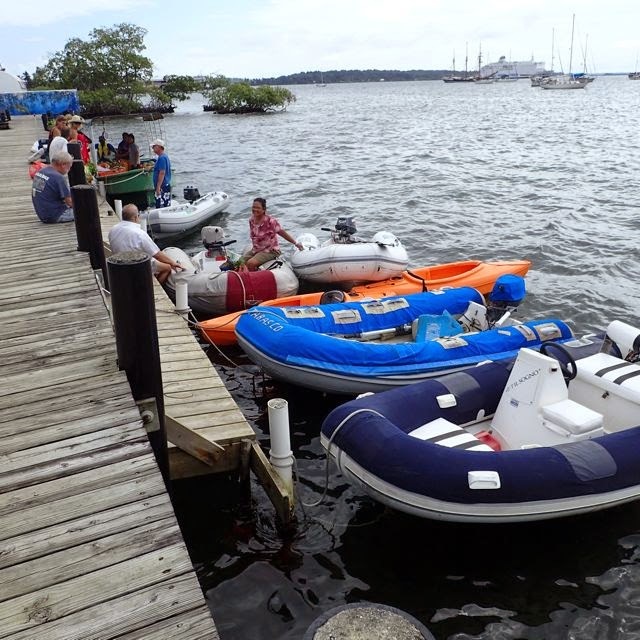 event at Bocas del Toro marina. I was on it like a dog on a bone -- away we went! 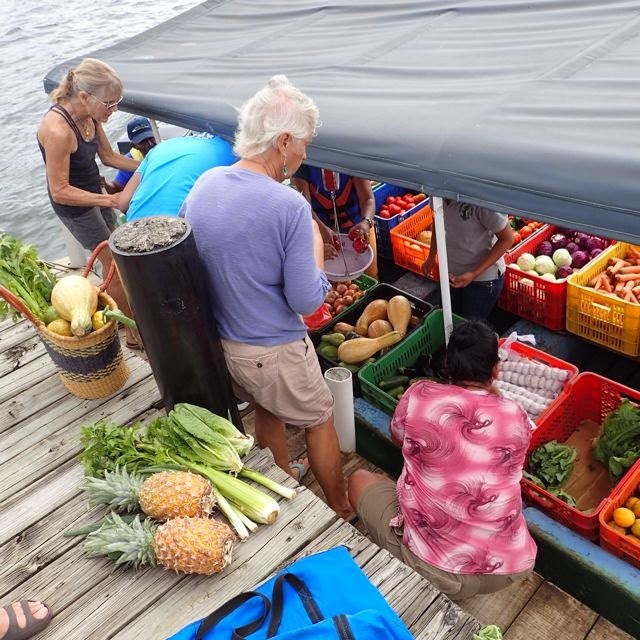 The dock was crowded with dinghies and cruisers, eagerly plucking away at pineapples and peppers, cauliflower and carrots, onions and oranges, lettuce and green onions, and so much more. The boat was a riot of fresh color. Baskets and bags abounded. Rumor was it was local -- and as a regular farmer's market aficionado -- it sucked me in. Regardless, it certainly looked much fresher and more appetizing than most of the fly-ridden produce in Bocas' many supermarkets (still a treat after being away from any markets for days and weeks at a time). It was less exotic than the monster-sized soursop and other more distinctively tropical produce purchased from Almirante fruit stands a few days prior. However, Alimirante "Chiquitas-ville" was a much dustier, dirtier town, and the stands were even more so. 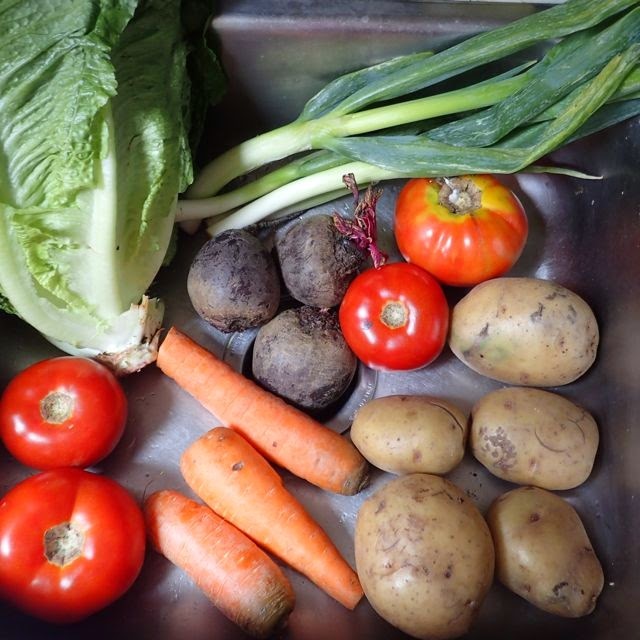 The veggie boat was spotlessly clean. Their prices were decent and produce was weighed, priced and bagged with a smile. and colorful as the produce. Before we knew it, we were on our way out, making our own contribution of amply lightening the veggie boat's load. After all, we were about to spend a week or so before we'd have an opportunity to to purchase perishables again. Something for everyone at the veggie boat. The experience brought back a small pang of nostalgia for our first cruising veggie boat encounter in St. Lucia (click here for that), which came right up to our boat. While a little less personal and convenient than boat side service, we're happy to have a few less scrapes on the side of our boat as a result of having to instead travel a few hundred yards by dinghy instead. 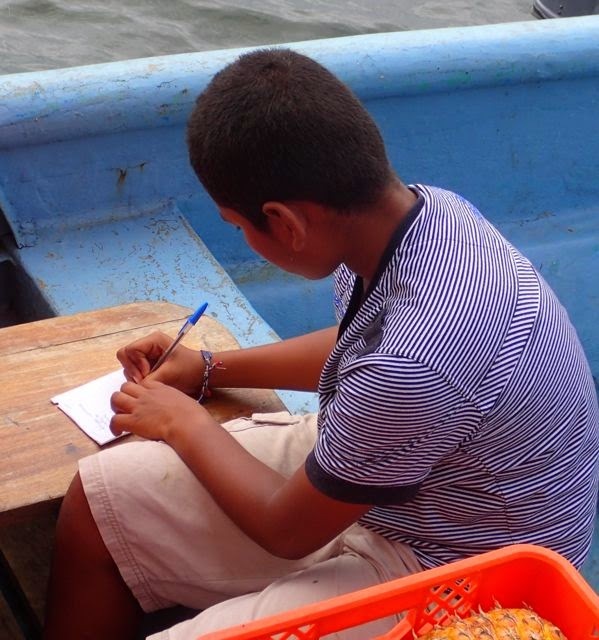 This is a recent retrospective from January 24, 2015, right before we left Bocas del Toro (N09.20.041 W82.14.606) , PANAMA We are currently docked in Shelter Bay Marina (N09.22.033 W79.57.097), outside Colon PANAMA, making arrangements for our upcoming Panama canal transit, currently targeted for February 13, 2015. Tomorrow we are scheduled to meet with the PANAMA ad measures folks, the first big step in initiating the transit process.